Like most of us, I want to be happier. Whether it’s waking up with more spark or going to bed more satisfied with my day, I want to open my life to the opportunity for greater joy. As such, I love to read books about happiness. My writer pal Gretchen Rubin has written a few of those, and in one of them she recommends a small, powerful idea that has taken hold to become a big, strong force in my own life. That idea is to choose a word each and every year that represents the year you have in front of you. Rather, to choose a word for your year. (Oh, and take a cue from Gretchen: years don’t need to start in January.) Choose one single word that imbues the type of year you wish to have, one word that can serve as a guidepost for what you want in the season to come. A singular word you can always harken back to in moments of darkness and doubt. One word that informs your decisions, crystallizes your passions and priorities, and embodies you – the new you! – in the months ahead. Depending on the type of year you seek, there are many words that can do the trick. Words like Move, Pause, Breathe, Dance, Less, Family, Health, Travel, and Choose all hold a certain special sauce. The guidelines are simple. The word can be a verb or a noun. It can be a long word or a short word. But it is key that the words brings together everything you fervently hope to live and breathe in the year to come. One word to inform and synthesize the year you have ahead of you. One word to mean everything you want the year to be, and one word that will help serve as a guiding light when times get tough and you’re not clear on where your priorities are. A few years ago my word was Rest. It was a word that meant the world to me in that season of my life. I was harried and overwhelmed from a few too many years of corporate globetrotting, and I needed a daily reminder to do less. And so I did. Although my Rest might not have been as restful as the Rest that some might be able to enjoy (I saw nary a beach that entire year), my word still served as a key force in getting me to slow down. It helped me to make decisions, and to keep in mind what was really important when difficult choices arose. Should I go to that social event – or stay home? Should I say yes to what could be a great opportunity, or pass it up to wait for something better to come along? Should I travel to that work meeting – or call into it instead? When life and work call for us to be busy, it is hard to slow down. However, by attempting to make this word forefront in my mind, I sought to make small strides that would lead to notable changes and positive transformation. I knew I wouldn’t be perfect. I knew I would never get it 100 percent. But I did know that by setting the intention, I could make some progress. I knew I wanted to take up Claire’s and Gretchen’s challenge of living with greater intent. But before I even got to the application of the word as a mantra for decisions and choices in my life, narrowing down of options for my words was difficult. I’m not in a place like Claire was in her example. I feel a deep-anxiety about cranking up the energy and finding “success” in a number of areas. So I want a word that motivates me without without pitfalls of feeling inadequate. I first considered all my desires for the next season of my life. I know I want to continue pursuing new professional opportunities. I considered Productivity, Challenge. I know I want to explore a new year in my marriage and focus on maintaining my relationships with friends and relatives. I considered Family, Community. My husband and I have already committed to traveling before we start a family. I considered Travel, Explore. I know that I want to separate my introversion from fear and anxiety. I considered Yes. After a good bit of brainstorming, the revelation was a single word that could summarize and benefit each of the corners of my life I’d like to improve: LEARN. New business opportunity? I’ll keep my eyes and ears open and absorb all I can do learn to do the job with proficiency. Working on a friendship deserving of more attention? Learning about those around me will challenge me to listen better and more deeply (and stay out of my own ego or anxiety, to boot). I started my year a week ago and I already feel rejuvenated by my new guiding mantra. It’s well-suited for me because – Learn (rather than, say, Win or Succeed or Earn) – is something I can easily do well every day…and enjoy. It doesn’t come with a distinct end goal or specific attachment to a measure of achievement. If I learn every day, I am succeeding. And I will have a much more humble, joyful and interesting journey that will still afford me the specific successes I seek. So bring on the year. What does the next year have in store for you? What’s your intention? How will your word shape your better life? 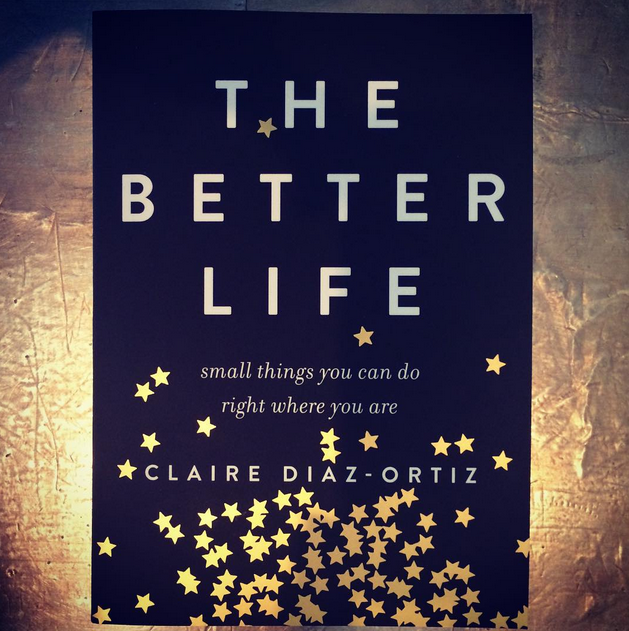 Find The Better Life and more of Claire’s books, articles, insight, wisdom and general loveliness on her blog: http://www.clairediazortiz.com. < Previous Coming out and keeping friends.